"If you're against killing fetuses, then don't kill one. I would never kill a fetus myself, but I don't want to impose my morality on anyone else." "If you're against killing abortionists, then don't kill one. I would never kill an abortionist myself, but I don't want to impose my morality on anyone else." ---Good comparison provided by an annoymous blogger on The Daily Beast blog site. The killing of a human being is usually considered murder. In the days of slavery, slaves were property, not human beings; therefore, to kill them was not murder. Today we don't discriminate according to race. We discriminate according to stage of life. 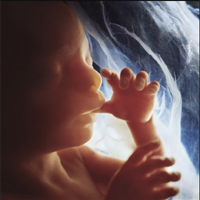 Those considered not to be human are the unborn. In the wake of the Tiller killing, abortion advocates are promulgating the falsehood that pro-life activism is responsible for the killing of late term abortionist, Tiller, because activists say that abortion is murder. Here's a response to that disingenuous ploy. USA Today blamed pro-lifers for the unjust killing of abortionist George Tiller because they have the audacity to use the word murder in reference to the killing of unborn children. If this is true, then media like USA Today are guilty of the deaths of millions of unborn children for failing to call abortion murder! You bear responsibility for violence. Indeed, USA Today might have prevented the murder of Tiller by exposing the truth about abortion and editorializing against the legalized killing of the innocent. Your June 3rd editorial actually stated that Tiller was not guilty of murder himself because, unlike his assailant, he acted within the law. With such logic one could conclude that so long as the direct killing of human beings is legal it is not morally unjust and ought not be opposed. Your publication supports legalized abortion and thus contributes to the killing of unborn children. But you may also have contributed to the murder of Tiller. You praised a man of violence, excused his late-term abortions, and supported his abortion services. Perhaps you could have saved his life by instead telling him the truth and calling him to responsibility. This may have led him out of the tragic and violent practice of abortion—a practice which sadly led to his own horrible and unjust death.